Two of the fiercest rivals in Premier League go head to head and Coral is out with an unmissable bargain! Make easy money on Arsenal vs Liverpool on Friday by claiming 28/1 ANY Yellow Card to be shown during the match at Coral Sportsbook! What a gift! Big matches often are hard fought battles and there are plenty of reasons to believe that many players will be booked in this clash! 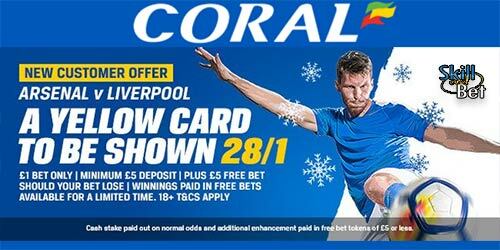 Claim a tasty 28/1 ANY Yellow Card to be shown in Arsenal v Liverpool when you join Coral via this page! Join Coral from now on to kick-off on Friday night to take advantage of this promotion! If a Yellow Card is shown during the match, you will collect your 28/1 bet! 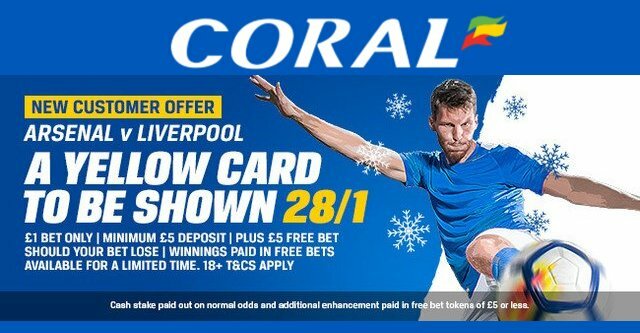 Coral are offering all our readers an unmissable 28/1 for a Yellow Card during Arsenal v Liverpool on Sunday, click this link to make easy money! Open a new Coral online or mobile account and bet on A Yellow Card To Be Shown in Arsenal v Liverpool 28/1. Offer available to UK & Republic of Ireland residents aged 18 years or over opening a new Online, Mobile or Coral Connect account in either £/€ currency through https://promotions.coral.co.uk/landing-pages/crazy-prices, https://promotions.coral.co.uk/landing-pages/crazy-prices-online, or the specific offer promotion box from coral.co.uk/sports/offers between 08:00 GMT Wednesday 20/12/2017 and 19:45 Friday 22/12/2017 with the exception of new accounts depositing funds with Moneybookers, Paysafe, Neteller or Skrill. Place your FIRST real money bet as a win single £/€1 on 'A Yellow Card To Be Shown 28/1’ in our “My Markets” sections. If your selection wins, you will be paid in cash based o n the normal price on site and will have your account topped up to reflect the enhanced price in free bets. Free bet winnings will expire after 4 days. "Arsenal v Liverpool: 28/1 A Yellow Card to be shown at Coral"